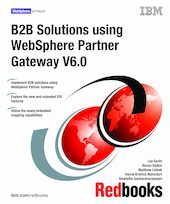 This IBM Redbooks publication introduces you to business-to-business (B2B) solutions based on WebSphere Partner Gateway. WebSphere Partner Gateway provides companies with the ability to deploy and manage an integrated B2B gateway solution, providing both traditional EDI translation and connectivity support, while also offering support for many of the newer standards such as AS1, AS2 and RosettaNet and, of course, support for legacy and proprietary data formats. We also introduce you to the imbedded transformation and mapping capabilities which are provided using the Data Interchange Services (DIS) client.